Some Writer! : The Story of E.B. White by Melissa Sweet. Grades 4-8. Houghton Mifflin Harcourt, October 2016. 160 pages. Review copy provided by publisher. You guys. Melissa Sweet is my GIRL. And she has outdone herself this time. Do any of you know a certain spider named Charlotte? What about a mouse named Stuart? Or a swan named Louis? If you know any of these classic children's book characters, you have author E.B. White to thank. E.B. White (his actual first name is Elwyn) grew up loving words and loving nature and animals. Ever since he was a young boy, Elwyn wrote and wrote and wrote. He wrote poems and articles. He wrote a guidebook to his family's favorite vacation spot at the lake. And yes, he wrote books. He wrote books that are now beloved and read by millions of children. This biography of E.B. 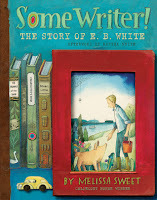 White tells about his childhood and his path to becoming a famous writer. My favorite thing about this book are the beautiful illustrations. I like how the author and illustrator weaves together photographs, diary pages, and bits of Elwyn's writing with her own original illustrations. I love the colors she uses to bring Elwyn to life in the pages of this book. If you are a writer or if you are a reader who loves books like Charlotte's Web or Stuart Little, pick up this book. This book is just a beauty. It feels like a beautiful scrapbook of E.B. White's life. Newspaper clippings, letters, photos, illustrations done in Sweet's signature mixed media style. The rainbow of colors and the care that Sweet takes to depict nature scenes emphasize Elwyn's love of nature and animals. I don't know what else to say except that this is a book for the writers out there. It's a love letter to writing and to a man whose life was devoted to writing in many different forms. Readers may be interested in other books about writers and wordsmiths that Melissa Sweet has illustrated: A River of Words: The Story of William Carlos Williams and The Right Word: Roget and his Thesaurus, both written by Jen Bryant. Or readers who are writers might enjoy books about the craft of writing like Writing Magic: Creating Stories That Fly by Gail Carson Levine.